Gor Mahia continued to overcome their off the field goals as they beat Vipers of Uganda 2-1 in the quarter-finals of the 2018 CECAFA club cup. The goals came from Jacque Tuyisenge and new Burundian signing Francis Mustafa. 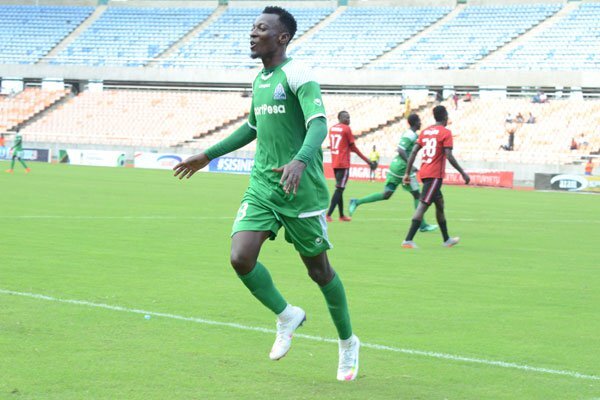 Mustafa Francis opened his Gor Mahia account with a vital goal as the Kenyan champions came from behind to beat Uganda’s Vipers SC 2-1 in Sunday’s Cecafa Kagame Cup quarterfinal match, at the National Stadium, Dar es Salaam. It was a perfect redemption for the Burundian international, who had wasted a host of scoring chances in the first half, before netting the winner to secure a semifinal ticket for Dylan Kerr’s side. Jacques Tuyisenge began the comeback cancelling out captain Tadeo Lwanga’s opener two minutes into the second half. “We showed character today and we deserve the victory. I am happy for Mustafa. Despite missing a few chances in the first half, he managed to win the game for us,” Kerr told The Standard Sports after the match. Gor Mahia will now meet the winner of today’s 4pm quarterfinal match between holders Azam and Rwanda’s Rayon Sports in tomorrow’s semifinal. K’Ogalo began the brighter side with an opposing defender brilliantly intercepting Innocent Wafula’s cross from the right. Wafula continued with his marauding runs down the flank, releasing an incisive pass but Francis’ header went wide before the Burundian miscued his close range shot from a weighted Godfrey Walusimbi’s lay-off. K’Ogalo were punished immediately as Tadeo Lwanga unleashed a looping 35 yards screamer that flew over helpless goalkeeper Boniface Oluoach to give the Ugandans the lead in the 15th minute. Francis could have drawn level in the 33rd minute when he received a brilliant through-ball from the midfield, but the new signing’s effort narrowly went wide. Humphrey Mieno then squandered two scoring chances in succession on the stroke of halftime. First, the former Tusker and AFC Leopards man forced a fine save from goalkeeper Bashir Sekagya before his glancing header went over the bar as Gor intensified their search for an equaliser. Francis Kahata then tapped wide from close range just one minute after coming on for injured Ernest Wendo. Gor started the second half with more of an attacking impetus and were rewarded with an equaliser just after two minutes when Jacques Tuyisenge poked the ball into the net from Francis’ delivery. Francis thought he had given Gor the lead on the hour mark only for the Tanzanian referee Emmanuel Mwandembwa to rule it offside. Vipers could have regained the lead in the 72nd minute but Dan Sserenkuma’s header from Yayo Kato’s free kick went wide. But Gor responded immediately with Francis finally opening his goal account when he comfortably controlled Tuyisenge’s cross in the box before beating the keeper. Meanwhile, Singida United coach Hemed Suleiman remains wary of the threat posed by Zanzibar’s Jeshi la Kujenga Uchumi as the two sides collide in the last quarterfinal match tonight (7pm). The match will be preceded by an early kick off (4pm) between holders Azam and Rwanda’s Rayon Sports. Hopefully the players will win this tournament, then we will see if Mugabe and Co. will have the audacity to continue ripping off the players and TB of their just rewards. Toiling and sweating for the good of the club only to be promised 20% which is even not paid while “ofis mafisi” pockets 80%. In the same spirit lets also thank the EC when the team is performing, and not condemn them when there is a small issue. Congrats once again to our EC for Job well done. Congrats team for the victory. Meanwhile it is wrong to incite players and bloggers that have being doing this are not taking the club anywhere. Shame on them. The imbeciles bloggers have now rotten eggs on their faces and they are stinking. Congregations team kubwa. Maintain focus and shame the devil. The Ugandan champion has fallen ( Not because Ugandan league is weak) because of your hard work. Let TZ bring their champion. Our buses are ready for the finals. Let’s congratulate these big hearted players, I can’t believe the way they are determined,or is it the coach? Whoever is behind this, hats off, I salute you. This Team Under The Stewardship Of The Great Sir Darling Kerr Is Irreprissible, Unbwgable, Unb Eatable, Unsuwable Even If The Thieving EC roadblocks upon its path! Mano kogalo SGR gari nyono gimoyudo e reru. Mit Ndiii..
OUR BELOVED TEAM, CONGRATULATIONS FOR THE GREAT WIN! The trademark of a true champion,congrats.and where was sserukuma? This Gor is just amazing, we are proud of you.When do we meet Azam? As usual much congratulations to the team…sometimes you need adversity to prosper ! EC please pay up or else ..the entire fanbase of kogallo shall join the players in solidarity when they come home next week and you can be sure the fire will burn some people! @Jakoyo, just say yourself will join in solidarity but not hiding behind the fanbase. Otama wuoyo ….Where is Janam? Ofuwo kabisa. We have anew not in town known as Francis Mustafa. Whether we loose to the next team, am a happy man. Where is Dan Ssrekuma.? The good thing with him is that he admitted that he is k ogalo fan. It also shows that in this region , we are king , having beaten the TZ champions Simba not so many weeks ago . the last 4weeks , in this 4weeks , this is a team that has been distracted by the sheninigans that is the EC , within the same time , this team has bid goodbye to its star striker Kagere , while at the same time having another star of it (kahata) being scavengely pursued but not distracted by an opponent (Simba) we whipped not so long ago and will again discipline in the course of the week . Now imagine if this team had the full backing of the EC and all this distractions were absent , this is a team that only the sky would be their limit , but we will get their , liwe liwalo and anyone , anybody who dares stand in our way should be ready to face the full wrath of the k’galo fraternity , diplomatically or OTHERWISE. To the prophets of doom , I advise that you defect to Afc Leopards coz that is where your types are . I attended the Bandari-Homeboys match at Mbaraki. All was well until some Bandari fans started hurling some hurting and personal insults at Allan Wanga. The Efusi fans in attendance could hear no more. They dared the Bandari fans to repeat the same insults when “The Teacher” comes calling. “Mnapiga tu kelele hapa kwa sababu Mwalimu amesafiri Dar. Mwalimu amecheza mechi 19 tu lakini tazameni amewaacha nyuma na pointi ngapi? Na kama mnashaka kuwa ni mwalimu basi ngojeeni muone kesho atakavyo mnyorosha Vipers”. Are we playing Simba or the winner of Azam/Rayon match in the semi finals!!! Some clarification Please!!! Yesterday’s publications had us playing the latter!!! I want Azam or Rayon in the semi finals. This will give us Simba in the finals!!! As for those who dont want to support the team, my only advise is that they will not derail our efforts. Their opinions dont count and we will continue with our call for a more responsive and transparent EC. Players MUST pe paid their dues in time and any pledges made MUST be redeemed in time if we are to be considered professional. I hate to admit thus, but I feel complacency is slowly creeping into the management of the club activities. I’d rather have any former player as the CEO and not this man called Aduda. He divides opinion as there is a group within Kogallo who feels he is the gatekeeper for one of the senior officials. Musymo, you are misleading us. I was too at the Bandari game…you are making it seem like it was a number of fans hurling insults at Wanga…it was basically one fan who is well known to be always abusing players. Meanwhile Simba has really struggled against A.S. Ports before winning 1 – 0. Kagere’ struggling and failure to score added to my happiness, why lie? Congratulations are in order for chuor timbe. I strongly believe in k’ogalo and I don’t expect them to loose to some mediocre teams in cecafa kagame cup. Let me remind the remaining lot that are waiting to be put to the sword of Gor mahia fc that they should know that the last time Gor mahia fc lost was in Pretoria against supersport united of south Africa in a car confederation cup qualifies where our beloved captain unfortunately scored an own goal and that was the last time Gor mahia fc lost 2:1 in favor of supersport united. Since then, Gor mahia fc have not lost in an open play. Even Hull city fc could not beat Gor mahia fc. To mit na ndi. @jasego…are we facing Simba or the winner between Azam and Rayon? Happiness in the camp…cngratulations Kerr n the boys for the wonderful performance…if anybody..e.c. dares to joke around with you, tuko gangari…keep it up God bless you n the fans. Glory be to God. @Abok Nyamwanda it must have been Bandari fans taunting AFC Leopards fans.Just reminding them that Paka akiondoka panya huonyasha ubabe wake. @jasego, you are very good at promoting hatred and discord among the club fans and EC. Stop the misplaced rumors about the chair whereabout who has done well with just few areas that need to be addressed. Otherwise keep on with rumour mongering skills on this site. Jasego, hapa umetudanganya bana. Gor Mahia will be playing Azam and not Simba. The match will be played on Wednesday. Double check the fixture list my friend. Thanks a lot my friend. J’Asego please confirm with the team about who we are playing in the semi-final. I believe that all semi-final matches will be played concurrently on Wednesday and we will meet the winner between Azam and Rayon who are playing today. @Jasego , while I share your disgust with AR in the manner he has left the club to run on Auto pilot , I am at a loss as at the totality of your article , infact the more I read it coupled with the example of Tite that you have used on his two years sojourn in Europe learning technical and tactical formations , the more I got confused since Tite was their in his capacity as a football tactician whereaa tactically and technically footballwise , Rachier is more of a layman than you Jasego and me . Should he account for his being in Russia , assuming he has used K’galo cash , then ofcourse yes . Systems put in place to achieve that Vision and for this , there is no need to go to Russia , all that is needed is a business model for which there are plenty locally , for modern football is a business just any other business . Lastly and on a light not , your assertion that AR has attended all the 64 games is a gross exageration since it is simply impossible . Azam 3 – 1 Rayon. Half time. Hatrick by Wonderboy Shabban Idd Chilunga. Speedy, sharp both in the air and on the ground. Strong on both feet. Jersey 7, orange boots. 6 goals in the tournament so far. Bother CorvusCorux, welcome. The moral of my post is the respect that Efusi fans apparently showed towards Gor Mahia. Kindly confirm if they did not refer to K’Ogalo as mwalimu. Kindly confirm if they never told Bandari fans that “saa hii mnapiga mdomo hapa na mwalimu akija mnajificha kule pembeni mwa uwanja, kimya!”. One Bandari fan who was standing throughout heckled andi insulted Wanga right from immediately after kick off. He was very vocal but always took cover when the camera was directed towards him. A few metres away from him was seated a middle-aged man of Bajuni roots whose insults were sporadic. Confirm if he didn’t shout at Wanga that “umetangatanga via kutosha sasa tafuta mume akuoe”. Confirm if the standing one did not join him in repeating the same message. How did the seated Efusi fans react to this? And didn’t the protests from Efusi fans draw in other Bandari fans? In my post I talked of some Bandari fans and I think this word some refers to two or more. The other Bandari fans who joined in argued that mwalimu is only strong because they spend a lot of money to buy quality players. Efusi fans of course asked them who has stopped them from buying quality players themselves given that KPA is the “owner of money”. I enjoyed the whole altercation and was left humbled by the way Efusi fans defended K’Ogalo. I am forced to elaborate on this light matter because I hate to be portrayed as a peddler of untruths. Full time Shabban Idd Chilunga 4 Rayon 2. Goals in minutes 18, 33, 36, 64. Heheheh. This guy calling himself Janam has been left with an egg on his face. How dare you judge a player not only on his debut match but also even before the match ends??!! Scoring two goals (though one was allegedly unfairly disallowed) for a young debatant is not ignorable. So cut the young man some slack bwana. Kogallo may just make another Olunga from Mustafa. Gor plays Azam on Wednesday according to cecafa 2018/fixtures and Standard Newspaper. This man Called Iddi, joining Tenerife in La Liga but by now playing for AZAM ( He scored 4 goals against Rayon sports in one game ) I hope our experienced cough is busy on the drawing board and i believe Kogalo defence will contain him. If i were Ker, i would put 2 defenders to handle him whenever he possess the ball. Good luck kogalo and entire funs. That is the point, Odhis Muga. We are highlighting him here so that our team does not underrate him. His first goal was a header, the second was a right foot hard shot while 3rd and 4th were unstoppable left foot shots. The boy is even too good for Tenerife. Now that it has been clarified who we are meeting in the semis , it comes to me as a godsend that we have to go to the finals through Azam , bcoz we also have some scores to settle with them courtesy of the last cecafa finals we lost to them . Secondly this match comes as a bonus for it gives our defence the chance of coming up against this man Iddi who so far is arguably the best striker in the tournament . Lastly in my imagined finals with Simba , it will be one more chance to proove to them that we are capable of beating them both home and away , and that waki jumuisha , tuna jumuisha , waki chukua Kagere , tuna chukua Mustapha . Kudos to the boys for winning tomorrows game . Hahaha Teddy ati…. one more chance to proove to them that….. waki jumuisha , tuna jumuisha , waki chukua Kagere , tuna chukua Mustapha . Meanwhile ……………we complain in kogallo of free transfers ! Brighton have tabled a South African record kshs 500 miilion offer for Percy Tau (mamelodi sundowns) which could rise to as high as kshs 650 million. now that is serious business in Africa. EC please style up ! Since we must and always have hope in our team Mayienga , we know it will be a tough game and we don’t underrate Azam, after beating them, we hope to meet Simba FC in the final. This would be a remarkable final since the teams will renew their rivalry. Kerr told the Simba SC that he is the best couch in East & Central africa and he is heading to England to meet Everton while Simba remains at home in Dar Es Salaam. I know Simba will never forget that cruel statement. When is the final match being played? Anyone with an idea? Jo thurwa azam kendo? iisorait isokay, but okombe biro dala. Through tututeng or yinda mbewa. Picking up from where @jakoyo has left on the $5m Brighton is paying to M.Sundowns and relating it to Gor Mahia , it is a statement of transparency , accountability and seriousness on the part of Mamelody to be open to the world and lay down the figures in broad daylight for the world to see , and I wonder if it was Gor receiving the money , if there would be any chance of we , the K’galo fraternity leave alone even sections of the EC knowing that money has changed hands . It is so sad that within minutes of a transaction happening thousands of miles away , we , who are not members of the club are privy to the club’s financial transactions , whereas we are unable to access financial transactions involving our club , transactions that are treated like some sort of military classified information . down on the kahata issue , players must be properly guided when they are signing contracts so that everybody knows and sticks to their lane . Evidently our first half display against Vipers was very scrappy. The second half was a total contrast and the sudden transformation after the break was amazing. Due credit should go to the team but more specifically to one Humphrey Ochieng’ Mieno. Wendo’s injury meant the Mieno had to drop deep at 6. What a Trojan! He completely pacified and dismantled the Vipers midfield, giving Kahata a very easy. I am happy for Mieno because he is now doing what we know him for. At this rate I am left wondering if it is a matter of time before the greedy Simba table their interest. Little wonder if Simba are now confused on who to go for between Kahata, Mieno and Phillemon. Mieno himself has opined that there’s nothing special about Azam and that we have our sights firmly trained on the final. It is to this end that this Shabban Idd Chilunda should be denied supply of balls. He is such a sharp finisher and very speedy. However, he is not a hustler and is easily dispossed in one on one or 50 – 50 balls. Our boys should make sure he is not supplied with balls. If we do this then he shall have nothing to finish. Finally, a fast rewind to our matches against Mathare, Chemelil, Sofapaka and Rayon in Rwanda: In all those matches, we were strong in the first half but collapsed in the second half and let comfortable leads slip away. This has not been the case in Dar. The boys have demonstrated renewed strength in the second half that has seen us come from behind and claim a point or an outright win. Thank you team. Congratulations and glory to God for this remarkable improvement and determination. You know the pain and humiliation we had to live with in 2015. Meet Azam tomorrow and wipe them from our memories. Flatten Azam for us. Boni Olouch, please work on your positioning in goal. Against Vipers you were lucky not to have conceded a second long range shot in the second half. Please bloggers with access to Azam TV, kindly update us on every minute of action. This is one of the most important matches in our history. Meanwhile Goal com reports that kahata is totally missing from the squad. Let’s accept and move on, he is nolonger with us at least mentally.